Groove foundations for dramatic scenes, soundscapes and songs. 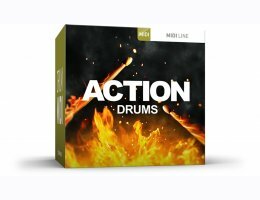 The Action Drums MIDI pack presents a collection of unique and unconventional grooves designed for use in any dramatic or action-packed scene, soundtrack or songwriting context. “My aim was to come up with slightly unconventional grooves and rhythmic structures that would serve as a foundation for high-intensity compositions. Having said that, the intention was to deliberately think out any other percussive elements, making each groove stand on its own. I wanted this to be a collection of full drum set grooves that could work as a starting point in a musical piece rather than a complement,” says drummer Norman Garschke. This is the perfect palette of drum foundations for any broad scope writer for film, TV or energetic music in general. Be it grooves for an action sequence, an intense breakbeat-inspired theme, a throbbing electronic track or a raging rock riff, you’ll strike a match. Expect one of the most all-encompassing collections of grooves yet. Start writing! This product requires EZDrummer or Superior Drummer virtual instrument plug-ins/software.